Drink healthier, great-tasting tap water with this BPA free Brita 10 cup water pitcher. With the Advanced filter technology, Brita cuts the taste and odor of chlorine to deliver great tasting water, and is certified to reduce copper, cadmium and mercury impurities, which can adversely affect your health over time. 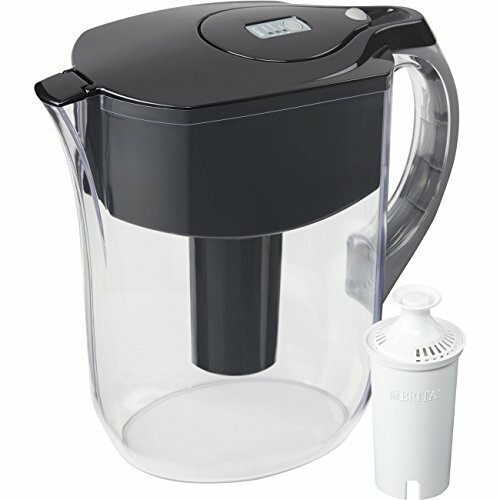 This black Brita pitcher has an ergonomic design which makes pouring easy. With the flip top lid, refilling is a breeze and just a glance at the electronic filter indicator lets you know when it is time to change the Brita replacement filter. This large water pitcher comes with 1 water filter, which should be changed every 40 gallons or about 2 months for best results. Start drinking healthier, great tasting water with Brita today.